Perfect for salads or serving, this beautiful bowl features colorful accents in bright confetti colors. 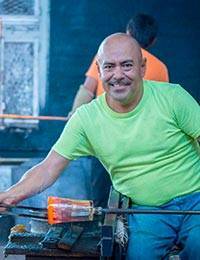 The eco-friendly design is handcrafted by Javier and Efren, using glass-blowing techniques perfected over more than thirty years. Please note that as each piece is individually handmade, slight variations in the shape and size of the glass are likely, making every item a unique example of blown-glass craftsmanship. Tiny bubbles within the surface attest to its authenticity. Bowl: 10.5 cm H x 25 cm Diam.